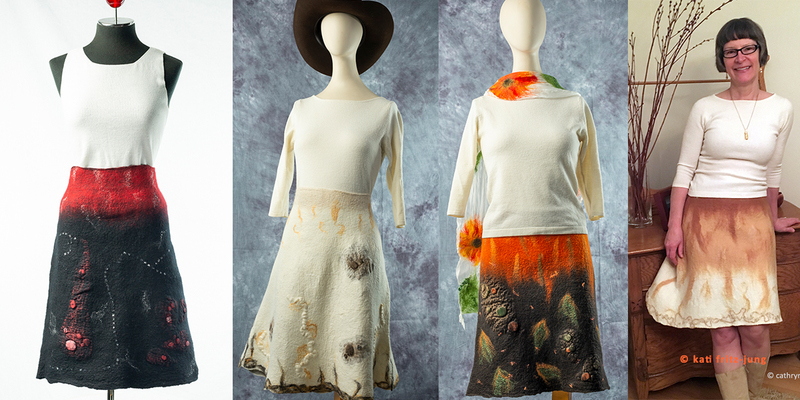 Take your basic nuno felting skills to the next level. In this class you will be making a skirt to the size you choose. You will also be learning options which replace the need for labor intensive rolling. This class will be given in a studio with lots of natural light on a scenic Wisconsin homestead farm. We will break for one hour for lunch when you can stroll to see cows or take a walk on a stream on the premise. Class is limited to six students so first time felters should feel welcome! Fee: $220 for two days. $50 for silk, wool, embellishments and zipper. Pattern made to your desired dimensions and all felting tools will be available. The pattern will be yours for the taking. You will choose wool color pallet before the class is given.